The one thing that I like best about Korean cuisine is the myriad accroutrements that come every dish. 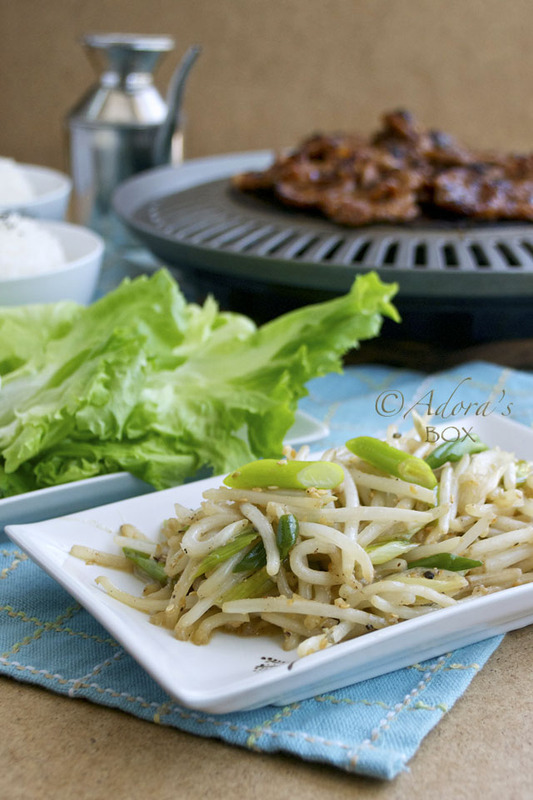 Although each one is delicious, it is the bean sprouts salad (sookju namul) that I like best. The bean sprouts are blanched before being mixed with a dressing. It's simple taste makes it the perfect side dish. 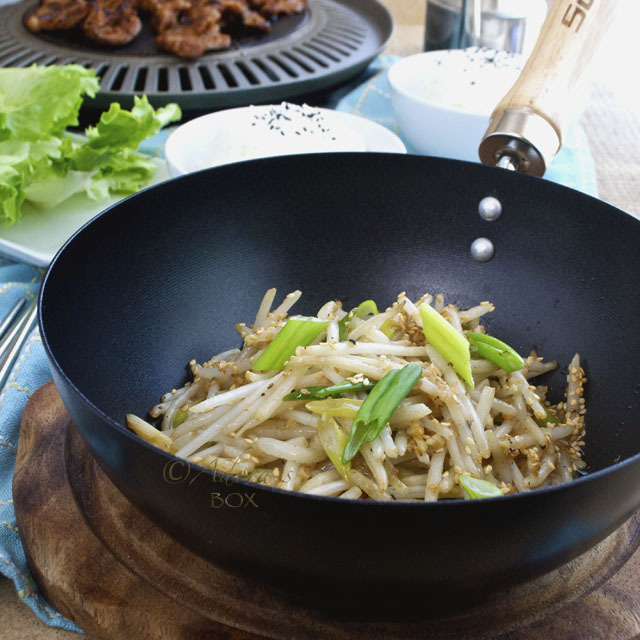 Although it is best served with Korean dishes (like bulgogi), it can be served with anything. 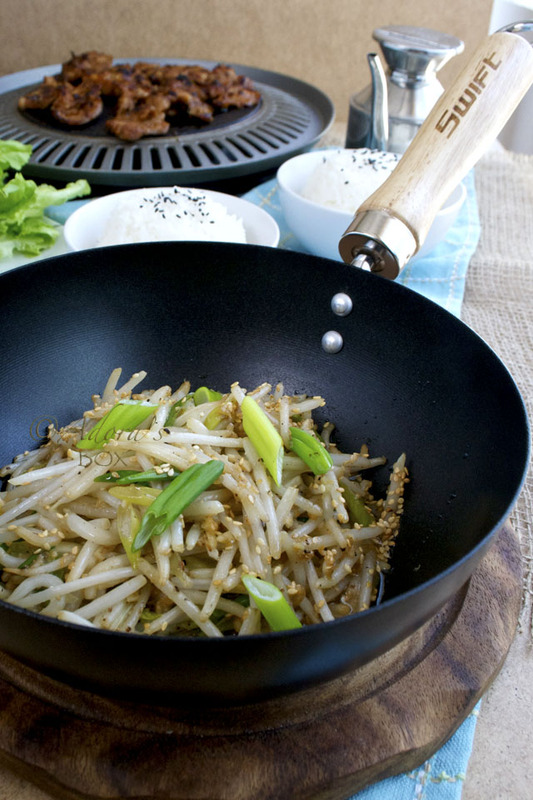 Bean sprouts are often overlooked as vegetables. 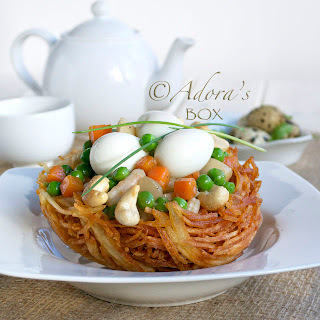 They are usually tossed tossed aimlessly with other ingredients just to give the dish an Oriental feel. They are often described as "tasteless and watery". They are actually very tasty if cooked properly and if cooked just to the right doneness has a crisp, fresh taste. Trimming the top and tail of the sprouts give it a cleaner taste. The roots, aside from being stringy, has an earthy taste. 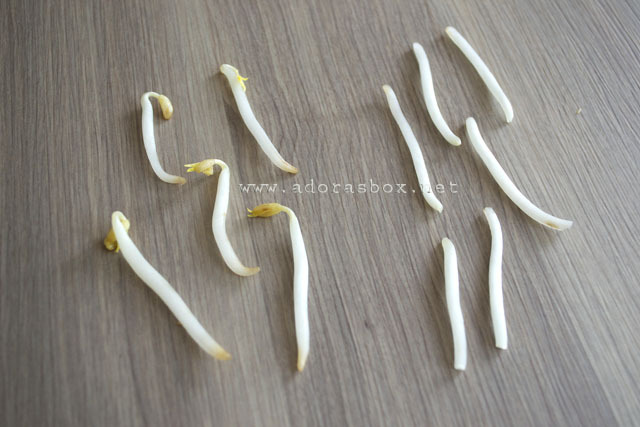 The mung bean seed (where the sprouts come from) head is usually wilted due to the sprouting process and has no merits in terms of taste. Patience is the key to making a plateful of cleaned sprouts. Cooked briefly and seasoned simply, they make a refreshing vegetable dish. Although I've used almost the same ingredients as the Korean salad, I chose to stir fry my sprouts to capture the essence of the wok and therefore add flavour. 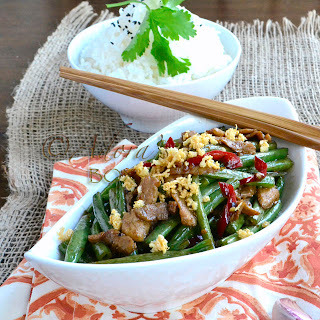 The stir frying process also kept the vegetable crisp. Although this is meant to be a side dish, I could eat a plateful of this all on its own. Top and tail the bean sprouts. This will make about 2 cups of trimmed sprouts. 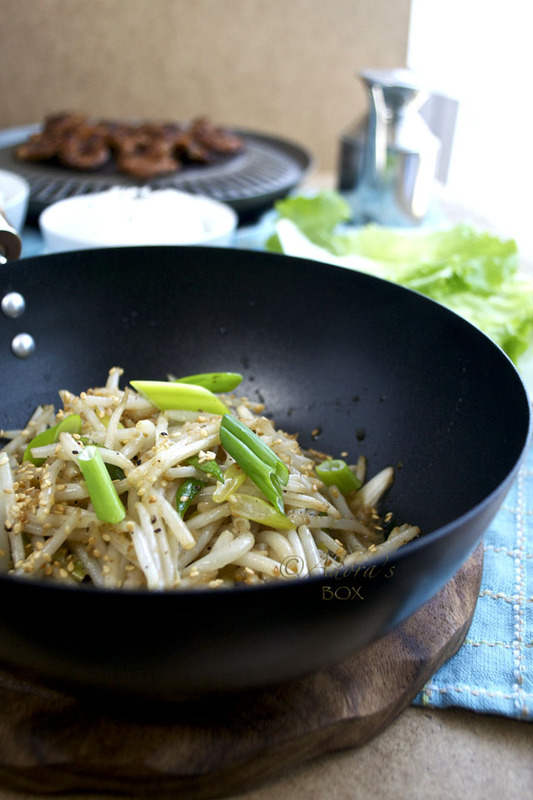 Heat up a wok and add in the oil. 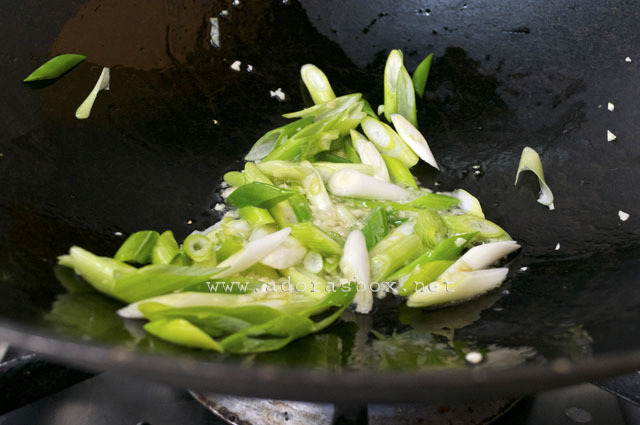 Add the garlic and spring onions together. Stir fry for 1 minute. 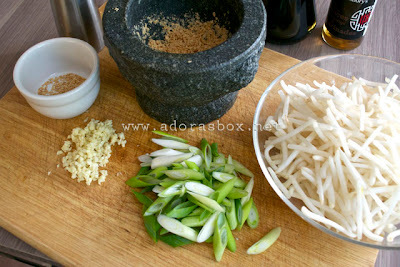 Add the bean sprouts, light soy sauce, mirin and ground sesame seeds. Stir fry for another minute then transfer to a serving dish straight away as this will continue to cook if left in the pan. Sprinkle with the remaining sesame seeds before serving. 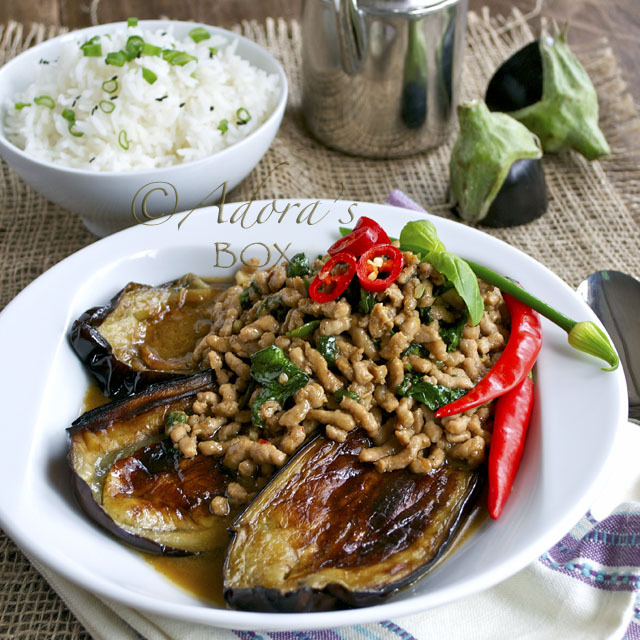 Such a simple dish but full of aroma and taste in it. I always love bean sprouts. 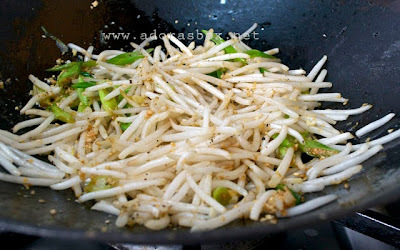 Do you know there is another type of bean sprouts Where the top head is much bigger in size and crunchy in bite? I think the Korean loves this type. Neverthess whichever types I love it. Hi Mel. 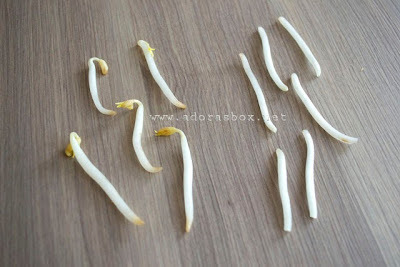 I've seen that type of bean sprout but I kinda like just the stalks hence I trim them. I absolutely hate soggy bean sprouts. You're right - I never see bean sprouts as the main vegetables. What a clever and very tasty dish! I really do need to make this!